What condition is your lawn in during winter? Would you like quick tips on how to gear up your lawn for winter so that it’s in good shape year round? Warm season grasses such as Buffalo and Couch will slow down their leaf growth and lose a bit of colour intensity as soon as average soil temperatures start to drop into the mid-teens and daylight hours decrease. However, the root system maintains activity in winter to keep going until spring’s rejuvenation period. Humans need vitamin C to stay healthy. So does your lawn. Using a fertiliser during autumn will boost the root system to help your lawn get greener again in spring. We recommend a fertiliser that does not contain a high percentage of nitrogen as it will soften the leaf and make the lawn more susceptible to cool temperatures, frost and wear. Some lawns get covered with a thick mat of leaves and other materials, known as thatch. This build-up can cause drainage issues and encourage moss, which potentially comes with fungal disease. It’s important to regularly rake off the dead leaves to promote a healthy lawn throughout winter. 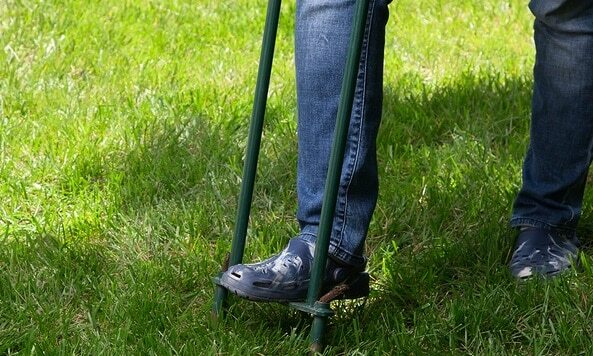 If there are particular hard and compacted areas, make sure you aerate the soil by spiking holds in your lawn. This allows better water penetration through to the root system. Spread some top dressing over the lawn to improve drainage and to level out any hollows. Aeration will help the root structure develop better and decrease moss build-up. Keeping your grass slightly longer in winter provides protection to the lawn against frost and makes your grass more hard-wearing. Just make sure you adjust the cutting height of your lawn mower. Here are just some tips on how to winterise your lawn. Please check out our turf varieties and we’d love to hear from you if you need to know which one best suits your garden.